Now, I know that in the past I have talked about my progress on the sleeves of my aran cardigan, but until now I have offered up no evidence to support all of my blabbing about said theoretical sleeves. For all you know, I could have been making it up, but behold: The Sleeve. Let me tell you a bit about this sleeve. 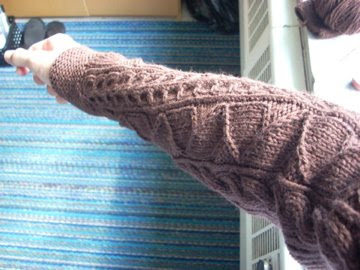 It all began when I was happily knitting around and around on the body until I thought I could no longer stand it and decided that I had reached the underarms. (I still think a may need to add some more length before I attach the sleeves, but for now I am still in denial.) 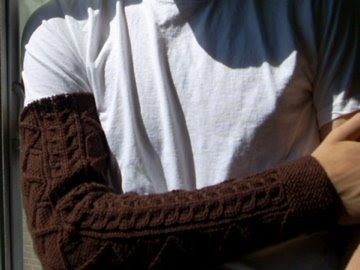 I was then all set to start knitting around and around on my sleeves until I realized - I hadn't designed them yet. Details schmetials. (Hmmm... it doesn't really work for that one does it.) This is the crazy part, so pay attention. I decided that I wanted my sleeve to be 9" around on the cuff, so I referred to my trusted gauge swatch and figured out that I needed to cast on 41 stitches for the garter cuff and then increase to 56 stitches when I started the cable pattern to make up for the way the cables pull the knitting in. Ok, so now I have 56 stitches just waiting to be assigned a role. I arbitrarily chose some cables that I had used on the body and placed them around the sleeve with 3 divider stitches in between each one (paying no attention to my stitch count) and guess what? It added up to 56!! Wow is right. ...a perfect sleeve. Thank you gauge. Isn't math wonderful? Hooray, gauge! I had some happy accidents with stitch counts like yours when I was working on my gansey. Daaaaaamn! Very impressive. I haven't even finished one sleeve on my sweater, and it just has a couple purl rows going up one side. Well done.